Scotiabank will increase their monthly account fee for Personal Bank Accounts, effective March 1, 2017. The Minimum Daily Closing Balance to waive monthly fee will be increased too. BMO is the first. Scotiabank is the second. Who will be the next one? Each KnowRoaming SIM Sticker and SIM Card comes with a free US and UK number. Both numbers can be used to send and receive calls while abroad. Text messages can be sent and received using your free UK number only. KnowRoaming’s prepaid platform puts you in control of your spending. 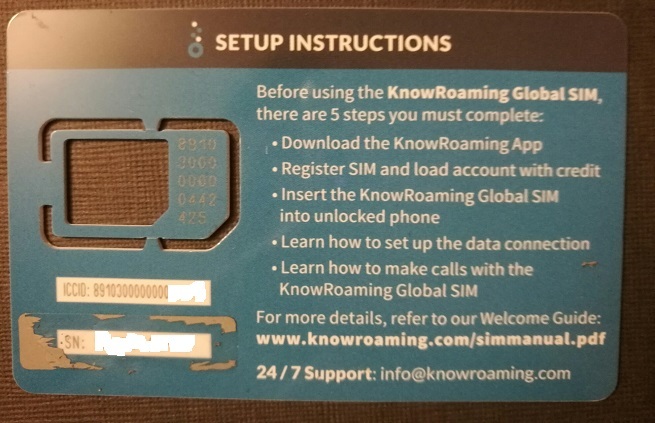 Before using KnowRoaming voice, text, or data services you will need to load credit to your account through the KnowRoaming app. You have the option to load credit in the amounts of $25, $50, $75, $100, and $150 using your credit card. (Visa, MasterCard, and American Express are accepted.) Following payment through the app, you’ll receive an email receipt. Since all services are prepaid, you will never be surprised by a bill after you return from your trip. There is also an optional auto-reload feature, which automatically tops up your KnowRoaming credit when your balance drops below $5. This ensures that calls and data sessions do not drop part-way through as a result of a $0 account balance. With auto-reload, your credit card is debited just as if you were making a manual purchase, but without having to go through the shopping cart and approval process. 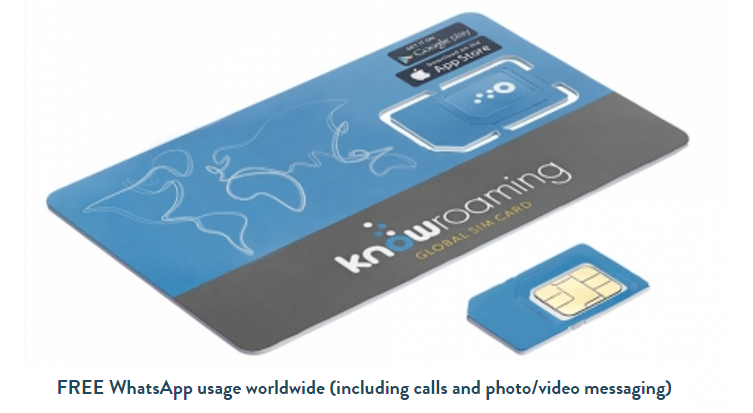 Any credit remaining in your KnowRoaming account after one trip can always be used on your next trip to any of the 200+ countries where KnowRoaming offers rates. Any unused credit on your account will expire after 15 months of inactivity. Only prepaid credit expires after the 15 month period. The Global SIM Sticker and Global SIM Card itself does not expire. One great thing: All WhatsApp usage is free on KnowRoaming products everywhere (including calls, phone/video messaging, texting, video calling). Please keep in mind that while WhatsApp does not require credit, other apps that pull data will use credit. This is good for children usage. All you need to pay is the SIM price at the beginning. I tested the Free WhatsApp with my backup phone, and it works very well. The Global SIM is USD $9.99. If you are interested in it, you can use our referral code "BOYA64" to buy it. 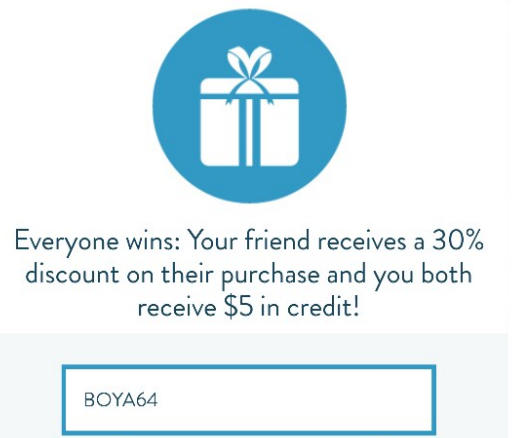 With our code, you can receive 30% discount on your purchase, and both of us will receive $5 in credit. Thanks. After that, if you share your experience to Facebook, you can get an extra $5 in credit. 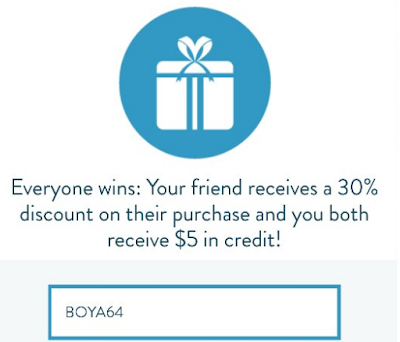 Basically, you pay USD $7 (plus tax) for the SIM, but you can get USD $10 with our referral code. Pretty good deal for new clients. Updated on Feb 19, 2018: Just got an email from KnowRoaming: "In order to continue offering our bonus WhatsApp promotion to our growing customer base, we have updated the eligibility requirements. This promotion is designed as a bonus for active customers using KnowRoaming services and will no longer be available for customers who have not loaded credit onto their account. In order to qualify for this promotion, you can simply load credit onto your account in the KnowRoaming app by selecting “Tap to Reload” and following the prompts. Once you have loaded credit onto your account, this promotion will automatically reactivate within 48 hours. Following this, you will be able to enjoy 30 days of free bonus WhatsApp usage each time you load credit." 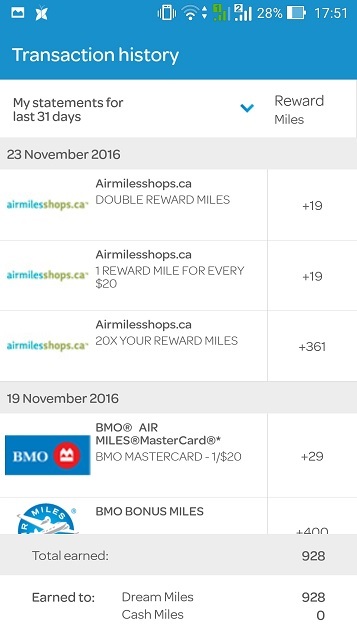 You can earn 10X Air Miles at airmilesshops.ca until Dec 29, 2016 (now Jan 5, 2017). This is about 5% cash back. This offer is available to customers who bring in an unlocked phone with new activation of Fido service. A $10 credit will be applied on or before your third invoice forward following the activation for 12 consecutive months (account must remain active). Offer available until December 31, 2016; subject to change without notice. A one-time $15 Transaction Fee applies for the processing of your phone activation. Celebrate the launch of NEW Esso Synergy Gasoline with 7 key ingredients to fuel your car. 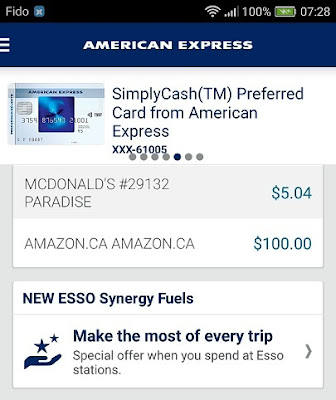 You could earn a $7 statement credit when you make a purchase of $25 or more (after taxes) at Esso stations! Register your eligible American Express Card from December 22, 2016 to January 13, 2017. Once registered, make a purchase of $25 or more (after taxes) in a single transaction at an Esso station between December 22, 2016 and January 13, 2017 and you could earn a $7 statement credit. Your eligible Card must be registered in advance of making a purchase in order for the purchase to be eligible for this offer. Register your eligible American Express Card between December 22, 2016 and January 13, 2017 by following the instructions on this page. Only the first 15,000 Canadian American Express Consumer and Small Business Cardmembers to successfully register will be eligible for this offer. Spend at an Esso station between December 22, 2016 and January 13, 2017 using your registered American Express Card to make a single purchase of $25 or more (after taxes). Enjoy a $7 statement credit - limit of one (1) statement credit per Registered Card. The statement credit will be applied to the Basic American Express Cardmember’s account. 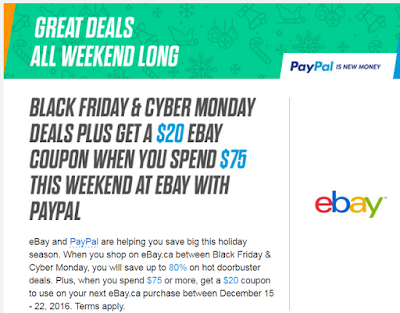 I get this same offer from AmEx App as well, which goes to the same force.com link. So this is legit for sure. TD Access Card now has the function of Interac Flash. 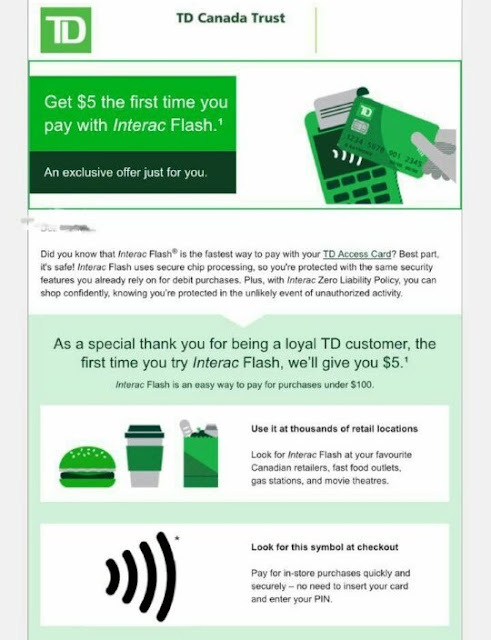 Some TD customers got an offer from TD: if they use the Interac Flash with their TD Access Card before Jan 19, 2017, they can get $5. This is a targeted offer. You can check your email for it. Different people may get different offer. The TD offer I received is: Save on interest – 0.99% for 6 months on balance transfers. 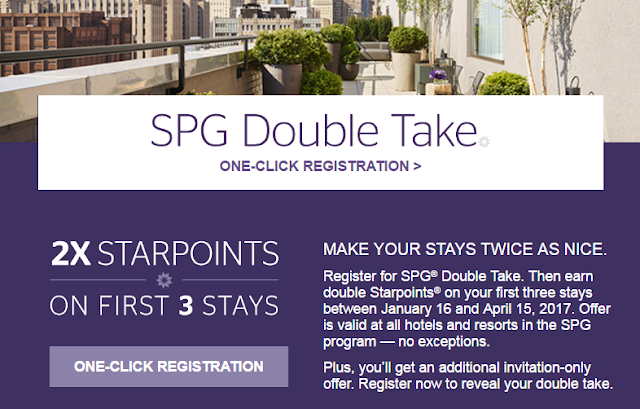 Please check your SPG linked email, you may find a promotion about SPG Double Take (online registration is required). With this offer, you can earn double Starpoints on your first three stays between January 16 and April 15, 2017. Offer is valid at all hotels and resorts in the SPG program. Parks Canada is inviting Canadians and visitors from around the world to celebrate Canada’s 150th anniversary at Canadian national treasures from coast to coast to coast. Your Parks Canada Discovery Pass provides free admission for the entire year to Parks Canada places from coast to coast to coast! Lockage at Parks Canada’s historic canals and waterways. Note: This is not an exhaustive list. Please verify with the location you will be visiting for more details. For every purchase made with your National Bank Mastercard credit card until December 31st, 2016, you can get a chance to win the grand prize! It consists of two prepaid Mastercard cards of $5,000 each, one for you and one for a friend! Note: Aimia Canada Inc. (“Aeroplan”), may select and use your Aeroplan Travel Story, (“Submission”) on its website located at aeroplan.com (“Website”), and/or in our various publications, including print publication, email communications, and social media, and you also agree for Aeroplan to use your first name, province of residence along with the Submission. You can get 20x AIR MILES reward miles on qualifying purchases of $20 CDN or more, excluding shipping, duty and taxes, made in a single transaction on December 16 2016. Offer applies to the total base reward miles earned on qualifying purchase amount excluding shipping, duty and taxes. Base offer may vary per store, click on store logo at airmilesshops.ca for details. 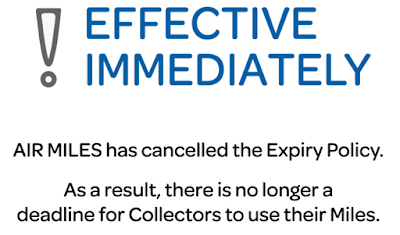 Collectors must sign in at airmilesshops.ca before purchasing in order to earn reward miles. Offer can be combined with other Bonus reward miles offers. This offer is valid on the purchase of gift cards only at online retailers who regularly offer reward miles on gift card purchases. See airmilesshops.ca for details. This offer does not apply to purchases made at Texture by Next Issue, or made at travel online stores (including travel bookings, car rentals, and hotels). Bonus reward miles will be posted to your Collector Account within 75 days after the promotional period. Dec 10th is the BIG bonus day of Canadian Tire. You can collect 30X e-Canadian Tire 'Money' on all merchandise purchased in-store at Canadian Tire when you pay with your Canadian Tire Options MasterCard. Plus, you can also enjoy 24 equal monthly payments with no fee and no interest before Dec 29th, 2016. 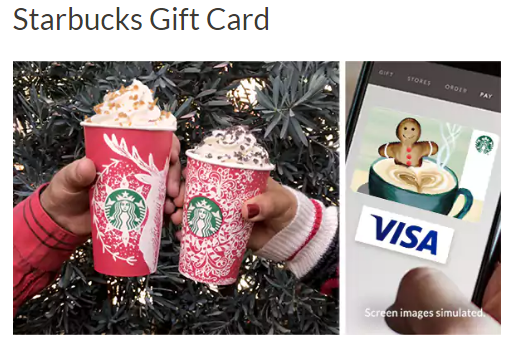 Be one of the first 45,000 to buy a $15 or more Starbucks Card eGift using your Visa Debit or credit card and you will get an additional $5, courtesy of Visa. 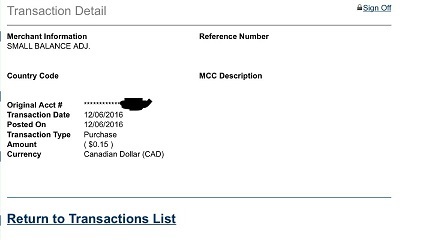 Send $15 – they get $20, send $25 – they get $30, send $45 – they get $50, just for using your Visa card. Offer available from 12/8/16 through 12/22/16, or while supplies last. Offer delivered in form of $5 Bonus Load to Starbucks eGift recipient. 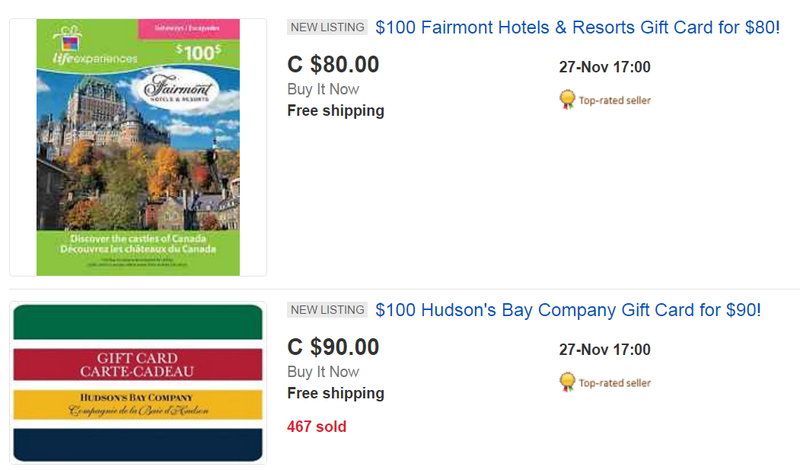 Offer available in Canada only (excluding Quebec). Limit 1 per person. Supplies are limited. I guess some of my blog readers already got the Fido 3GB-$15/month deal + the FREE LG G Pad III, just like me. Do you want to turn your tablet into a "phone"? I would like to introduce the App I am currently using: Talkatone (I am NOT paid to write this blog...). Talkatone is a smartphone App. I know it long time ago, when it is still with Google voice (no Canadian phone number available from Talkatone that time). 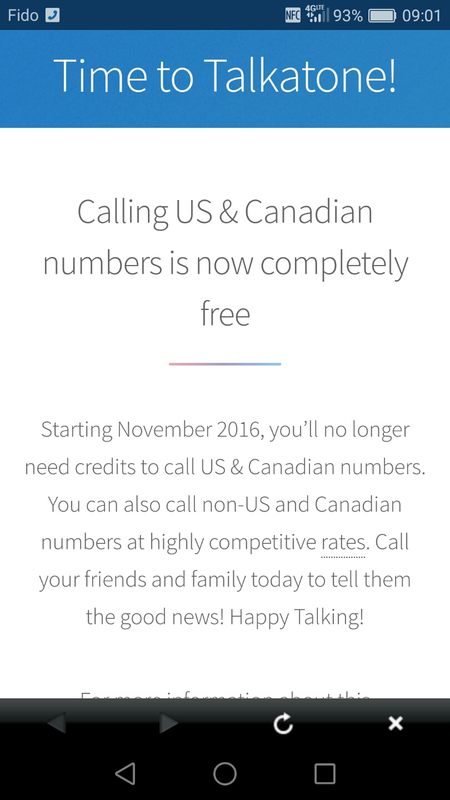 Now, you can get a Free Canadian phone number in your area code (for most of the Canadian provinces..., not all) from Talkatone. Users in any of these countries will get a free US or Canadian phone number, and free unlimited calling to US & Canadian numbers. 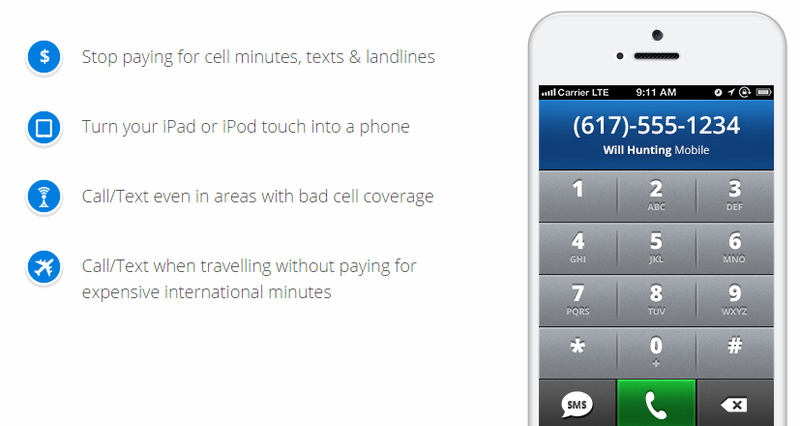 Talkatone lets you call and text any US/Canadian phone over WiFi or Data (3G/4G/LTE) for FREE. From my experiences, the call quality using Talkatone over Data is quite good. And its free text is definitely better than Fongo. You can also call internationally, but you need to buy or earn credits from Talkatone. Note: If you haven't used Talkatone to call or text for a period of 30 days, your Talkatone account will be debited 20 paid credits to keep your number active. If you haven't been active for 30 days and you have less than 20 credits on your account your number will be deactivated and returned. You will get a notification, before that happens, to give you a chance to make a call or text to maintain your number assigned to your account. From now to Dec 19, 2016, when you purchase UA miles, you could receive a bonus of up to 100% more. Just go to the above link and unwrap your own mystery offer. You can discover your special bonus when you click through and start planning your next trip. I tried it myself, and only eligible for a bonus of up to 25% more miles on my purchase. Hope you can get 100% more bonus miles. Good news: Air Miles customers no longer have to worry about their miles. 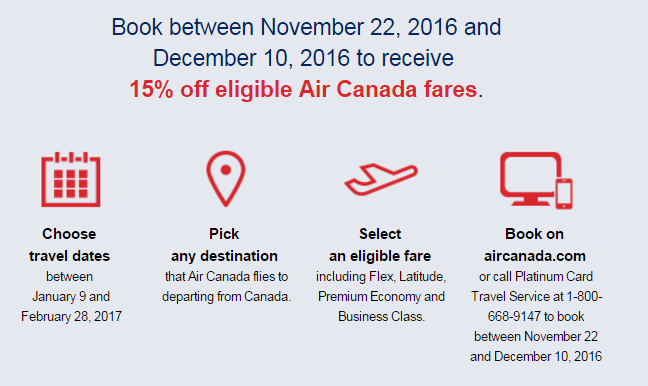 Today, Air Miles announced it is cancelling its expiry policy that was scheduled to take effect on Dec.31. The decision is effective immediately. 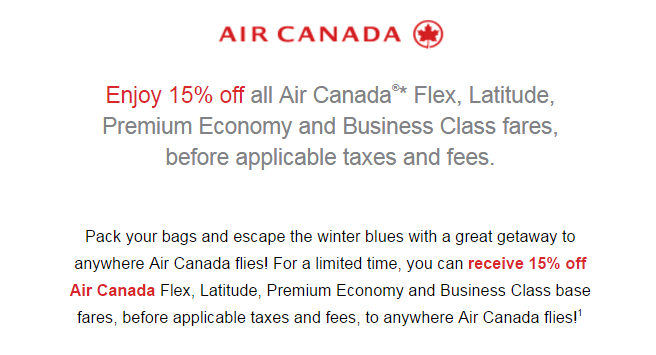 Air Miles said "it believes that cancelling the expiry policy will lead to more meaningful conversations between government and industry, helping to ensure loyalty programs remain viable in all provinces and that Canadian consumers continue to reap the rewards of loyalty programs, regardless of the province in which they live." Best Buy's Cyber Monday deals are coming. You can get $10 off your purchase of $100 or more when you use Visa Checkout to pay for your order on Best Buy before Dec 2, 2016. 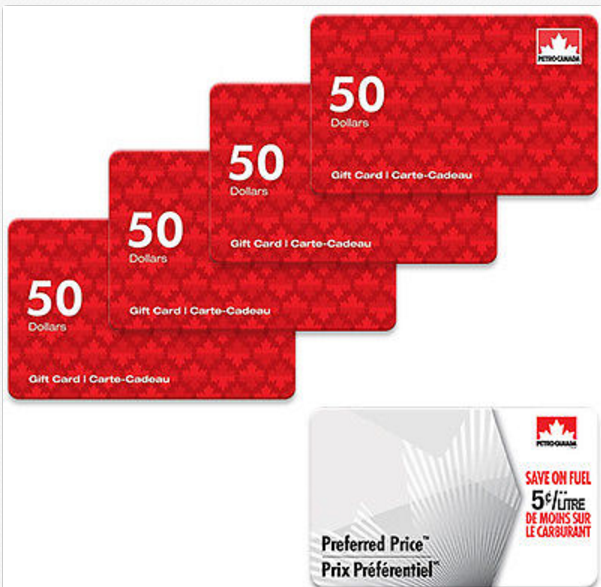 Now, you can $200 Petro-Canada Gift Cards for $194 + a bonus $25 Fuel Savings Card from ebay.ca (Free Shipping). If you don't like the PC cards, you can choose the $100 Sears Gift Card for $95 (with the same seller). Last but not least, you can choose Paypal as the payment method, and get a $20 coupon to use on your next ebay.ca purchase between Dec 15-22, 2016. Some of my friends already got the 21X Air Miles for the Petro-Canada gift cards. RateSupermarket.ca is offering promotion on Tangerine Money-Back MasterCard. 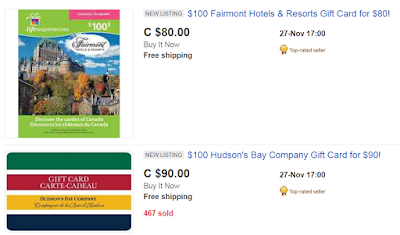 You will get a $100 gift card earn 4% Money-Back rewards for the first 3 months, if you apply them through ratesupermarket.ca. You can choose your Gift Card from Amazon.ca, Starbucks, Best Buy and Ultimate Dining. From Saturday, November 26, 2016 to Sunday, November 27, 2016, you can spend 50,000 Shoppers Optimum Points and get up to $85 OFF PLUS get $20 worth of points back. That’s a $105 savings value! OR spend 95,000 points and get up to $170 OFF PLUS get $40 worth of points back. That’s a $210 savings value! 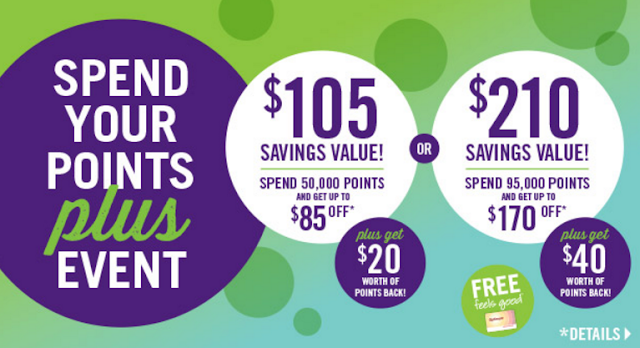 The $20 worth of points back on 50,000 points level redeemed is equivalent to 16,000 Shoppers Optimum Points. The $40 worth of points back on 95,000 points level redeemed is equivalent to 30,000 Shoppers Optimum Points. Shoppers Optimum Points will be awarded by December 12, 2016. 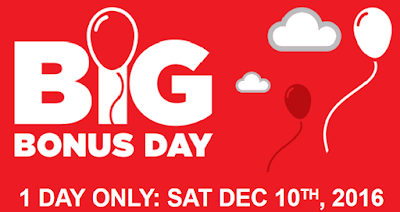 Note: Offer excludes prescription purchases, products with codeine, non-pointable items, tobacco products (where applicable), stamps, passport photos, lottery tickets, event tickets, transit tickets and passes, gift cards, prepaid phone cards, prepaid card products and Shoppers Home Health Care locations. Not to be used in conjunction with any other Shoppers Optimum Points promotions or promotional card offers. You can earn 5X Aeroplan miles for every dollar spent on Costco.ca from Nov 24 to Nov 28, 2016. Note: Aeroplan Miles are credited on the purchase price of products offered online at Costco.ca and will not include shipping and handling, tax or other additional charges. If the product you are purchasing has a discount or promotion, you will not be credited Aeroplan Miles for the amount of the discount or promotion. Ineligible purchases include: new Costco memberships, Costco membership renewals, gift of membership, tires, Costco Cash Cards, custom installation services, travel and online digital print orders. 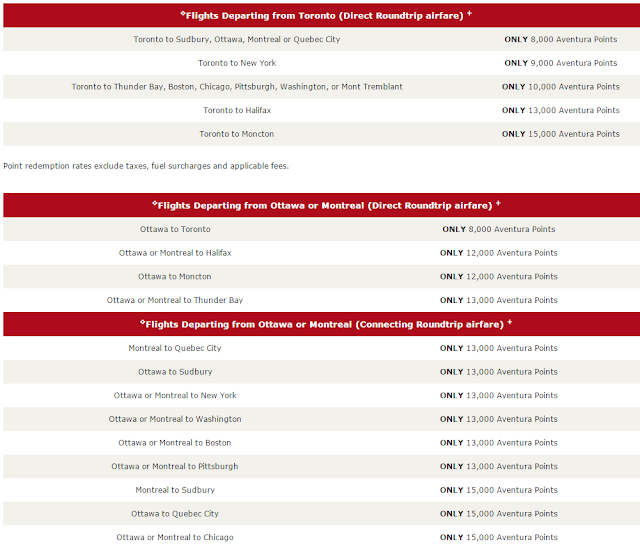 Aeroplan Miles will not be awarded on cancelled or returned orders. 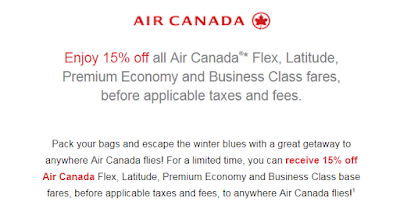 If you are a AmEx cardholder, you may receive one email from AmEx that you can enjoy 15% off for all Air Canada Flex, Latitude, Premium Economy and Business Class fares (not including Tango) before taxes and fees, to anywhere Air Canada flies. You need to book before Dec 10, 2016 and travel between Jan 9 to Feb 28, 2017. At time of booking, you need to use the personal promotion code in the email along with your American Express Card (personal promotion code is valid for one-time use only). Ratehub.ca is offering a free credit score now (just like mogo, borrowell, credit karma). Their score is based on Equifax. One of the good things: this score is available to QC residents. From Ratehub's FAQ, this check should be a "soft" credit inquiry and does not affect the score. 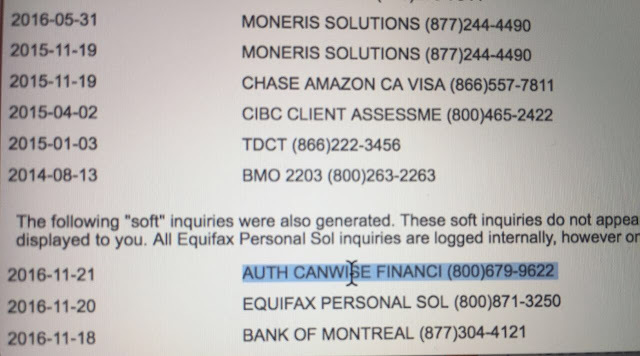 But one of our readers reported to us, that he checked his Equifax report right after checking his score on Ratehub.ca. He found one hard pull and one soft pull from CANWISE Financial. 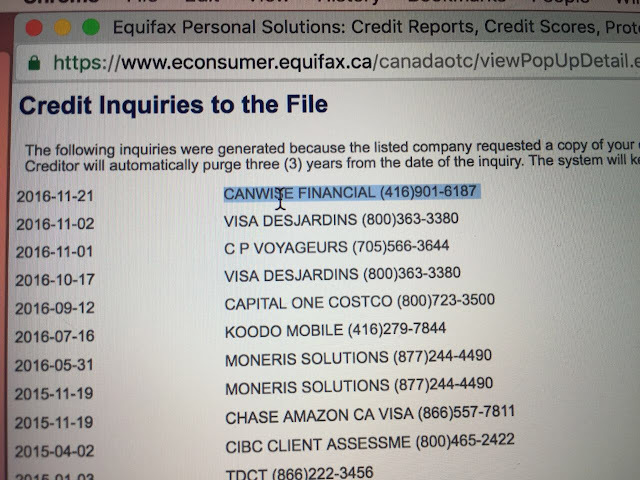 RateHub is aware that a hard credit score pull was occurring through Equifax and appearing as RateHub's mortgage brokerage "CanWise Financial". The error was identified immediately to Equifax and RateHub worked closely with the bureau to correct it for the roughly 50 affected users. If you were impacted by a hard pull, this has been reversed by Equifax, though it may take up to 24 hours for your credit report to be updated. A select number of early users of RateHub's free credit scores may also see the company's soft inquiry appear as CanWise Financial. Rest assured, RateHub's free credit scores are soft inquiries only, as an educational tool to help users select financial products that are best suited to them. 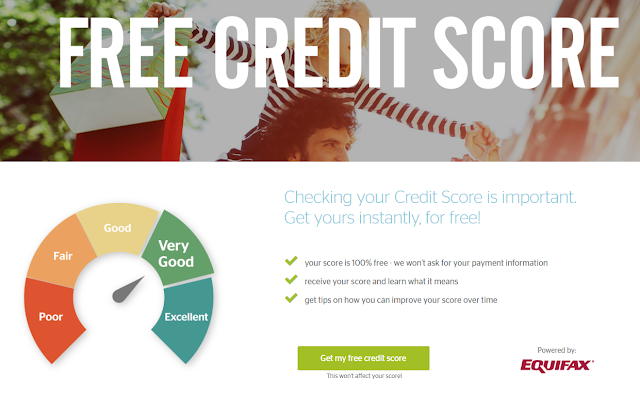 A soft pull does not affect your credit score and RateHub free credit score users will not see any impact to their scores. 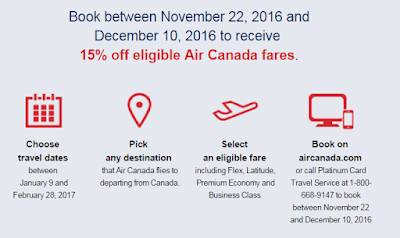 You can get 20x AIRMILES reward miles on qualifying purchases of $20 CDN or more, excluding shipping, duty and taxes, made in a single transaction between November 21 and November 30, 2016. Offer applies to the total base reward miles earned on qualifying purchase amount excluding shipping, duty and taxes. Bonus reward miles will be posted to your Collector Account within 75 days after the promotional period. Base offer may vary per store, click on store logo at airmilesshops.ca for details. 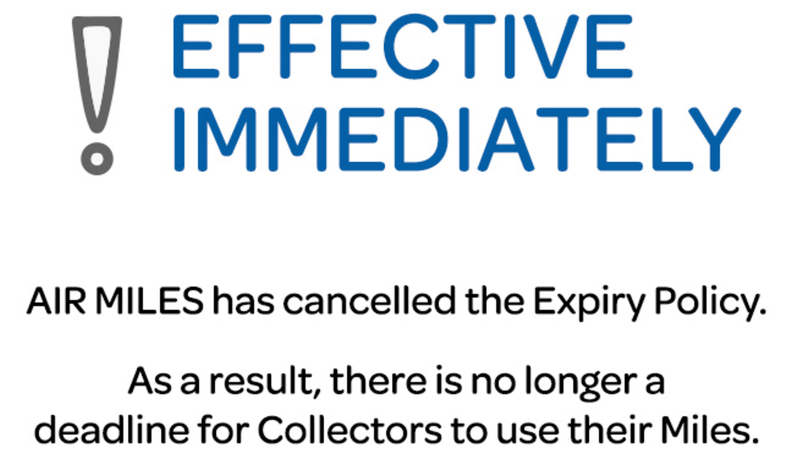 Collectors must sign in at airmilesshops.ca before purchasing in order to earn reward miles. 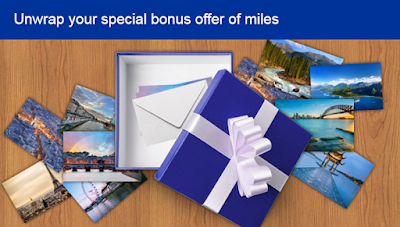 Offer can be combined with other Bonus reward miles offers. Note: This offer is valid on the purchase of gift cards only at online retailers who regularly offer reward miles on gift card purchases. See airmilesshops.ca for details. This offer does not apply to purchases made at Rogers Magazine subscriptions , Texture by Next Issue, or made at travel online stores. I made a Newegg.ca order through AirMilesShops.ca on Nov 23 and I got the 22X miles today. You can get a 1% Cash Bonus on new deposits (so totally interest 2.5%) with Meridian high interest saving account. New Assets must be received into a Qualifying Account not later than 4:00 p.m. Toronto time by February 28, 2017. New Assets received on or before February 28, 2017 must remain in the Qualifying Account until December 15, 2017 (the “Hold Date”). Transfers between Qualifying Accounts are permitted. The Member must transfer in a minimum of $10,000 per Member from an account held at another financial institution. The maximum bonus payable is $500 per Member.